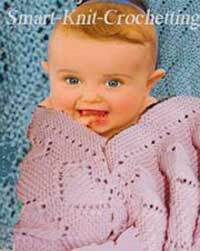 We will use this easy baby blanket knit pattern as an example for the simple calculations which are necessary in order to knit ANY baby blanket. This baby blanket pattern is not for just making a copy of it. My intention is to give you idea for the design of ANY blanket. Once you get the idea, you will never look for someone's descriptions. So....don't try too hard to be exact. It's just a small blanket. -:) Lets begin. Step 1. Make the gauge swatch. This baby blanket pattern is based on a garter stitch which will look identical on the both sides of the blanket. Dimensions of the blanket are 32" x 32" inches. Each ridge of the garter stitch pattern is equal to two rows of knitting. A garter stitch pattern will make a baby blanket pretty thick and warm. To decorate our blanket, we will knit the hearts on it. 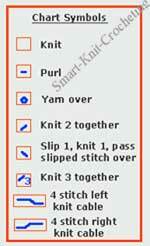 To knit each heart 19 stitches and 18 rows are necessary (see the chart). Knitting symbols to read the patterns are below for your reference. The hearts are placed in rows and columns. The rows are separated by the 6-row wide horizontal strips. The columns are separated by the 8-stitch wide vertical strips. You can change distances between columns and rows if you wish. When I made a swatch, here is what I've got: 16 stitches = 4.0 in, 28 rows = 4 in. Hence: my gauge is: 16 st / 4.0 in = 4.0 st/in. 28 rows / 4 in = 7.0 rows/in. So far so good. We are going to knit a blanket 32 in x 32 in. How many stitches do we have to cast on? According to our gauge, for every one inch of blanket width we have to cast on 4.0 stitches. To make a blanket 32 in wide we will need: 4.0 st/in x 32 in = 128 st. Our knit pattern is multiple of 27 stitches ( a heart itself plus an 8-stitch wide strip between the columns). Horizontal layout for our baby blanket knit pattern: 128 st = (27 st. x 4 columns) + (8 stitches, to make the pattern symmetrical) + ( 6 stitches x 2, to form the blanket borders). Vertical layout for the pattern. How many rows do we have to knit? For every one inch of blanket we have to knit 7 rows. Number of rows for 32 in long blanket : 7.0 rows/in x 32 in = 224 rows. 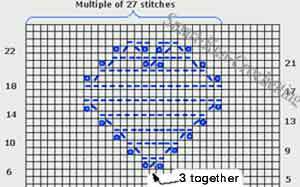 In vertical direction our pattern is multiple of 26 rows (18 rows for the heart itself + 8 rows between the rows of hearts). Here is how we can distribute the pattern: 224 rows = (18 rows+ 8 rows) x 8 times + (8 rows to make the pattern symmetrical) + (2 x 4 rows, to form the blanket borders). Cast off loosely. To make blanket knit pattern, which we used in this example more attractive, decorate the blanket by some edging. Perhaps, the simplest kind of decoration are the small holes around the perimeter while knitting the blanket. Crochet some simple edging around the blanket would also be a good idea. Lightly steam the blanket. Remember: never put weigh of the iron on your crocheted or knitted fabric if it has texture on it. Let the iron just slightly touch it.